Logical progression and goal setting are two key components to learning any new skill. The Rounds Club testing created by the Minnesota Kali Group is perhaps one of the best ways to learn Muay Thai, vastly improve your fitness level and keep your motivation up during the process. Do you want to learn more about the Rounds Tests? 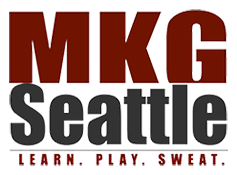 Join us May 4th to learn about the fundamentals of each test and techniques for both holding and hitting. For those students interested in Muay Thai, tough training, and great workouts, this is the seminar to attend! *Mandatory for those taking the 10, 5 or TBA Test! FREE to all Rounds Testers and Holders! $20.00 for all other interested students. 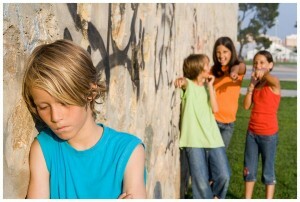 The test itself is scheduled for June 7th. No special permission is needed for the 1 hour test, just sign up. 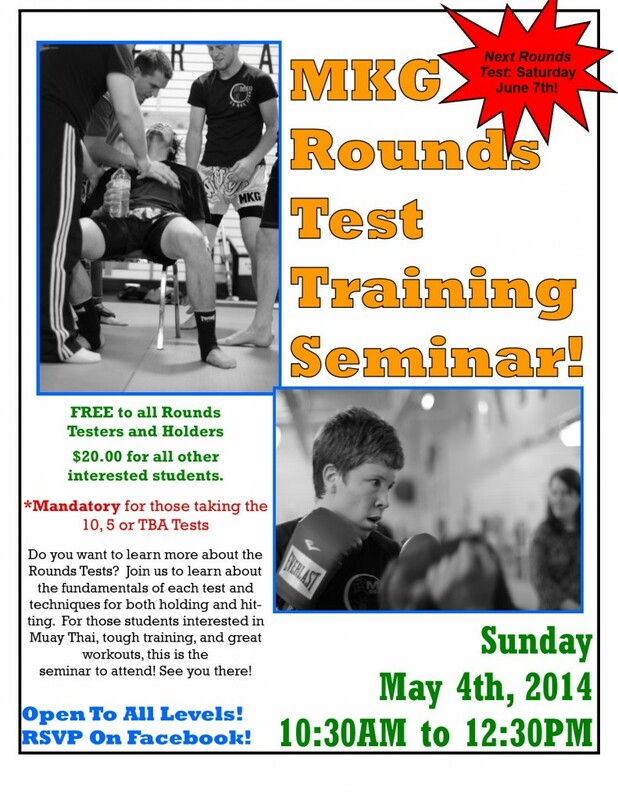 Those that are testing for the 10 round, 5 round or TBA need to get permission first and start training NOW. Cost is $35 (includes free shirt). Test fee due 1 month prior to test to reserve shirt size. Effective Monday, April 14, 2014 7:30 pm classes on Mondays and Wednesdays will be moving to 7 pm. Tuesday and Thursday nights schedule will remain the same. See the MAX10 Schedule for the most current list of classes. Yoga starts on Sunday, April 27, 2014 at 9:30 am – this is a free class offered to all MAX10 Fitness members, MKG Martial Arts students and CrossFit MKG members. 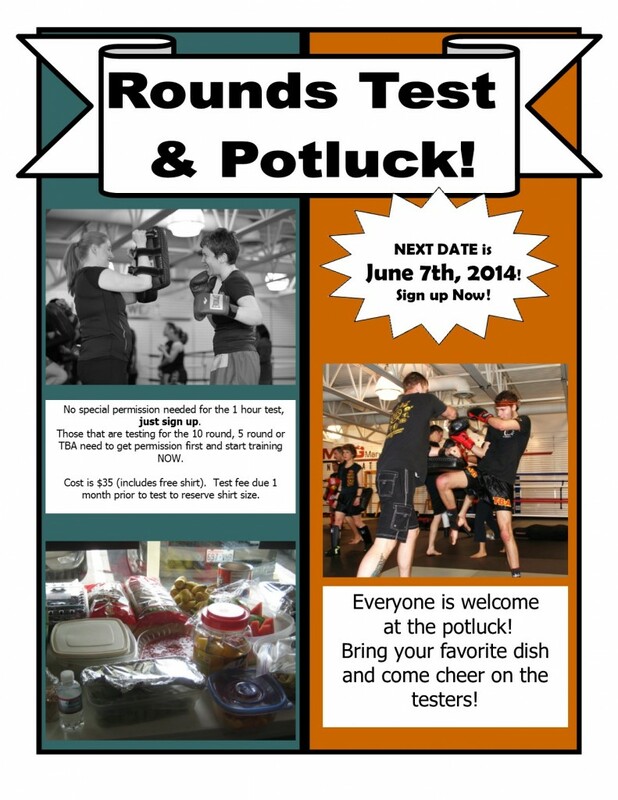 MKG Rounds Test (Muay Thai) will be held on June 7, 2014 from 1-4 pm. Testers/holders need to arrive by 12:30 pm. Potluck immediately following. Monday 6:30 am PT Co-Op (thru June 2nd) – Manolito will focus on Muay Thai long counts and thai pad holding. Even if you are not testing this will be a fun workout and opportunity for you to learn some new combinations. Bring a buddy (optional) and come on in! 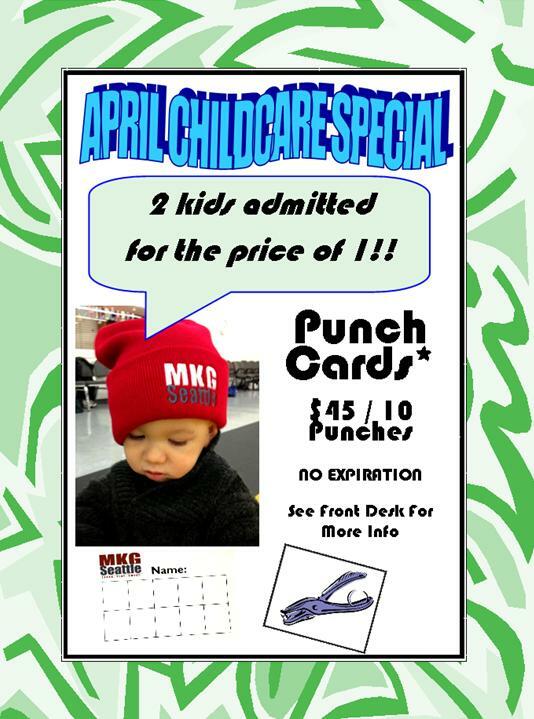 Love kickboxing? 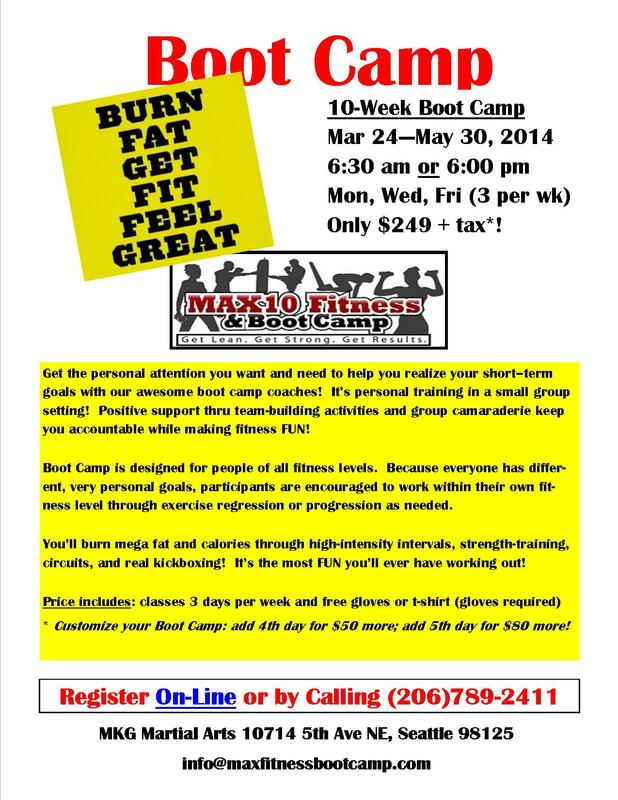 Try our boot camp – you’ll love it! 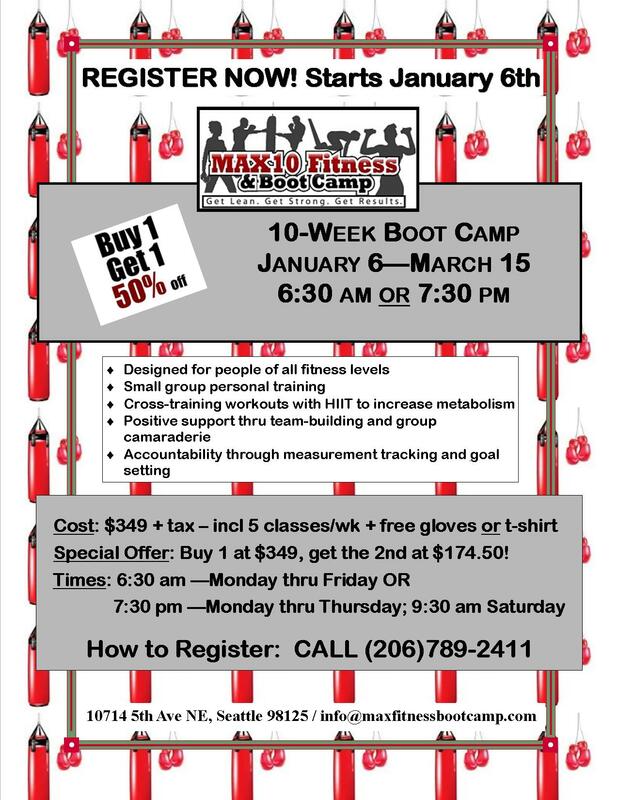 Bringing back the 5-day/week boot camp! 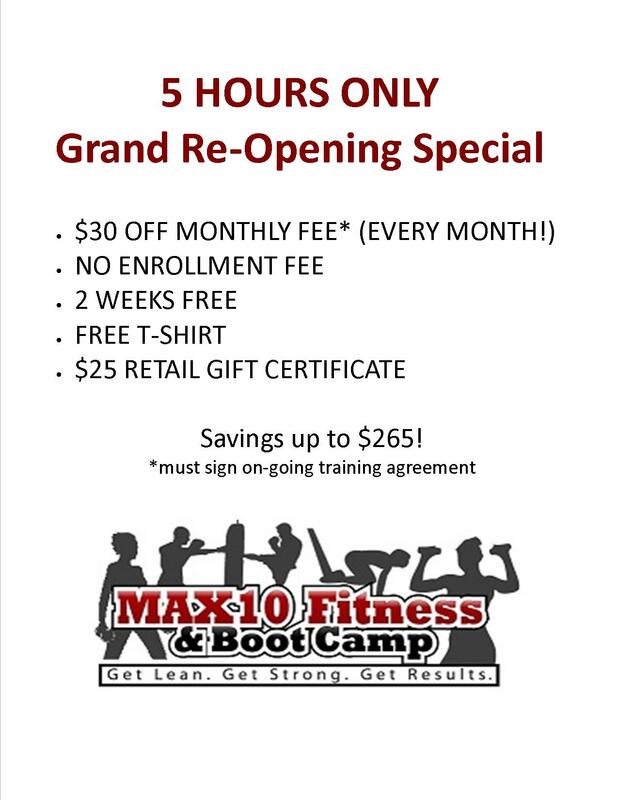 Starts January 6th! Let this be the year that you regain your health! 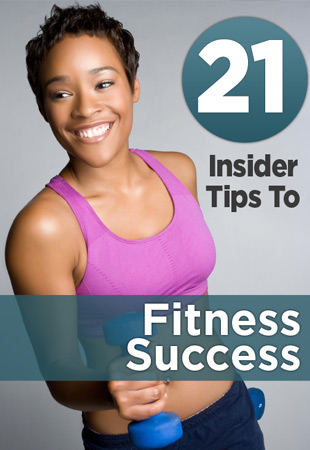 Create a healthy lifestyle and lose the extra weight! Stop beating yourself up and JUST DO IT®! Only 16 spots available per session. Sign up on-line NOW to secure your registration! 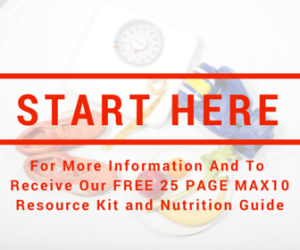 Nov. 2nd – Mobile Hydrostatic Body Fat Testing – Sign Up Today! We’re so excited to have the Mobile Hydrostatic Body Fat Testing available at our grand Re-Opening / Open House on November 2nd. 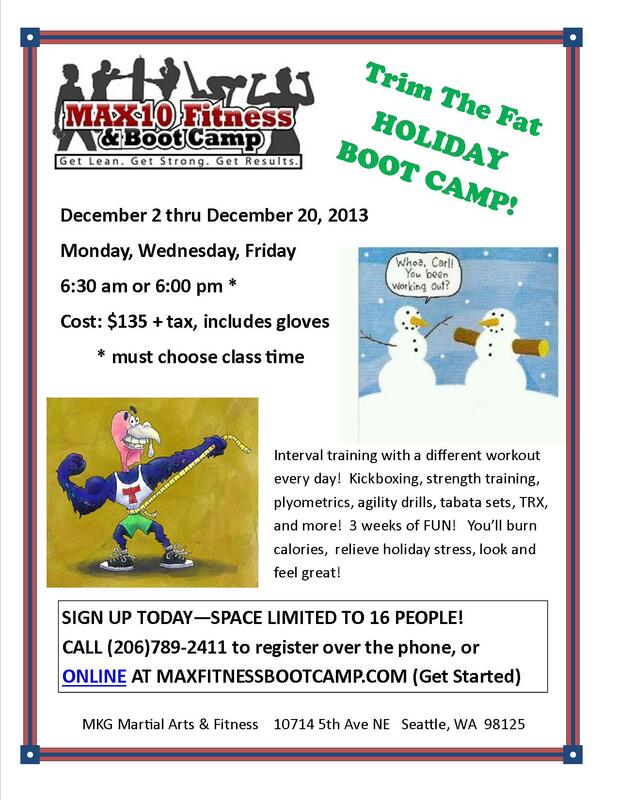 Trim The Fat Holiday Camp starts December 2nd! 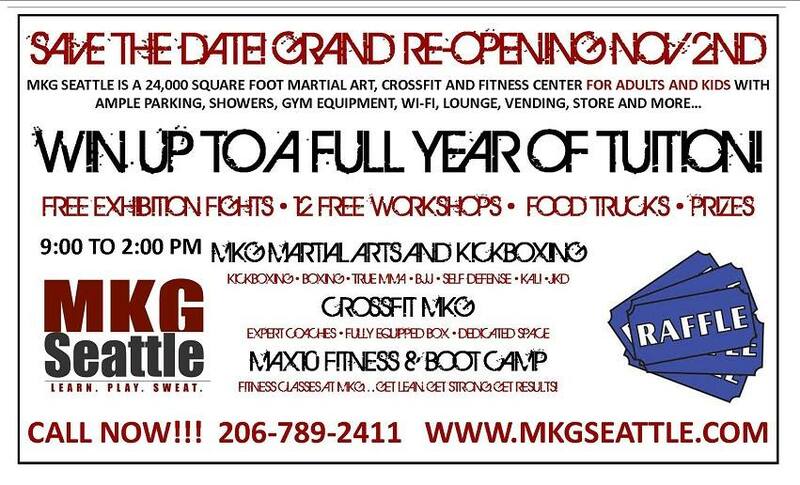 MKG Grand Re-Opening, November 2nd 9am to 2 pm – Don’t miss it! Free classes at 9:00 am, 10:00 am, and 11:00 am! Raffle prize drawings EVERY HOUR! Prizes include: free year of tuition, free lessons & personal training, comic books, coffee cards, equipment, gift cards, restaurant certificates, jump ropes, supplements, baked goods, and more!